13-year-old Mikael Granberg disappears without a trace in 1978. Thirty years later Astrid Sammils finds Mikael’s hat in the house of her deceased uncle, whose farm she has inherited. Could her uncle have had something to do with the disappearance? She does not think so, and decides to try to find out what really happened. At the same time a drug trial is under way in Romania. One of the physicians gets suspicious when several patients drop out. It is no surprise that the two storylines are connected, but it takes a while before you understand how. 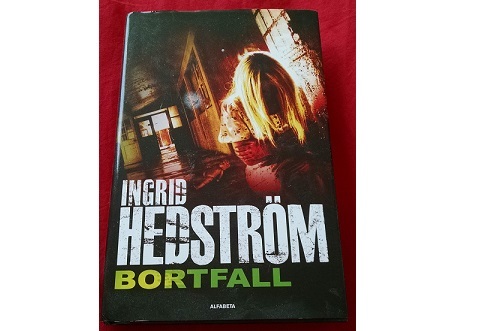 Ingrid Hedström has written the popular Villette series (six novels) about the investigating magistrate Martine Poirot in Belgium. This novel is the first one in her new series about the diplomat Astrid Sammils. The next novel in the series will be published in Swedish later this year. The novel was pretty slow at first and it took a while for me to get hooked. Some things were fairly obvious but there were some surprises too. I thought this novel was better than the ones I have read from the Villette series.